The North Carolina Department of Agriculture and Consumer Services maintains a list of suppliers authorized to sell bees and queens within the state. That list, along with additional services and information important to North Carolina beekeepers, can be found on the Department’s Apiary Services site. Look for a link to “List of Dealers Authorized to Sell Bees in NC” on the Apiary Services page. OCBA has two honey extractors available for the use of its members. The smaller extractor is a two-frame, tangential extractor. Because of its size and its plastic construction it is easier to transport. The larger extractor is a six-frame, stainless steel, radial extractor. In addition to the extractors, OCBA has a full complement of tools and accessories necessary to extract honey. The rental charge for one extractor and the accessory tools is $5 per day or part of day. Please review the Extractor Policy prior to renting an extractor for the most current information. In addition to training and supporting beekeepers, OCBA’s mission includes public education and awareness of beekeeping and pollinator habitat preservation. Our members are available to staff information tables at community events and to present at community groups of all sizes. Please contact us with your needs. Members directly sharing bee books with other members. OCBA’s Bee2Bee Library provides members with access to sometimes expensive beekeeping education volumes on a member to member basis. Go to Bee2Bee to see what volumes are available. 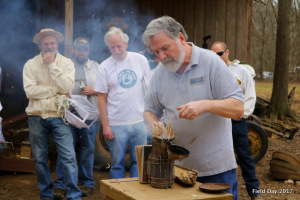 Randall Austin, OCBA’s Master Beekeeper Coordinator, has written an excellent series of articles addressing a wide range of beekeeping topics. 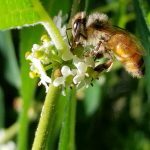 These articles are a superb resource for all beekeepers. Effective January 2017 beekeepers are no longer permitted to treat their hives with antibiotics to control European Foul Brood or other bacterial disease. The Honey Bee Veterinary Consortium provides a link to North Carolina veterinarians who have an interest in working with bees and beekeepers.